President Duterte wants to withdraw PH from Rome Statute that created the Int'l Criminal Court---sans approval of the Senate as required by the Constitution. Without Senate action, however, as Justice Carpio stresses, Duterte's move would be invalid. But what's Presidential Legal Adviser Sal Panelo saying that PH has, in fact, already withdrawn from the ICC? The Senate should summon Panelo to explain. A new conflict is brewing which promises to pit President Duterte and his legal team headed by Secretary Sal Panelo, and Executive Secretary Salvador Medialdea in one corner, vs. Vice President Leni Robredo, senior Associate Justice Antonio Carpio and the opposition bloc in the Senate, led by Senate Minority Leader Franklin Drilon. Except for the stand of Associate Justice Carpio who is perceived to be quite independent-minded, the verbal tussle over the Philippines' membership in the International Criminal Court---between the President and his legal team vs. Vice President Leni Robredo and the Senate opposition on the other hand---will be perceived wrongly as political. The present controversy should be apolitical, however, as it is rooted in the Constitution. Proof is that this issue is pending in the Supreme Court where oral arguments on the validity or non-validity of PH's intention to withdraw from the ICC was heard last Tuesday. Remember Fatou Bensouda, the feisty Gambian special prosecutor of the International Criminal Court (ICC) who came here last Feb. 08, 2018 purportedly to start preliminary investigation on alleged human rights violations in this country, in connection with the Duterte's administration's intensified war on drugs? Bensouda's visit and utterances caught world attention, provoking angry threats from President Duterte---that led to his announcement last March 17, 2018 of our country's purported withdrawal of support for the Rome Statute that created the ICC. But that controversy simmered down after select voices made Mr. Duterte realize that backing out of the Rome Statute would give the country a worse black eye in the international community---perhaps even affirming all the more his brutal war vs. drugs here, that he doesn't want it investigated. Hence, nothing further erupted in the word war between the President and Bensouda. That truce was apparently temporary, for Mr. Duterte was quoted in Philippine Star recently as reviving his intention to withdraw the country from commitment to the ICC. Such withdrawal, however, is not that simple. The Philippines was signatory to the Rome Statute that established the ICC, which came into full force on July 1, 2017 in Rome, with 123 states as party to the Statute, including the Philippines. But just as there is a way for this country to enter into a treaty, as expressed in the Philippine Constitution, there is also a prescribed way to withdraw our commitment. Sec. 21 of Article VII on the "Executive Department" in the Constitution states that "No treaty or international agreement shall be valid and effective unless concurred in by at least two-thirds of all the members of the Senate." After last Tuesday's hearing of the SC on President Duterte's intention to withdraw Philippine commitment to the ICC, Senior SC Associate Justice Antonio Carpio was quoted in Philippine Star as asserting, "The President's duty is to faithfully execute the law. You said that a treaty has the status of a law. So the President has to faithfully execute a treaty, correct?" Carpio stressed that inasmuch as commitment to the ICC is THE RESULT OF A TREATY, to repeal it, Congress must also first pass a new law for such purpose. Or to put it another way, the senior magistrate asserted to Malacanang: "YOU CANNOT OBVIOUSLY REPEAL THE TREATY YOURSELF, CORRECT? YOU CANNOT ABROGATE IT, CORRECT? (emphasis BOC's). Or to still put it differently, the SC senior magistrate stressed: "If IT IS NOT THE SOLE DISCRETION OF THE PRESIDENT TO BE PART OF (A TREATY) IT'S ALSO NOT HIS SOLE DISCRETION TO WITHDRAW FROM IT." (emphasis BOC's). But Carpio also reminded the senators and Mr. Duterte that to repeal a treaty, "you don't need 2/3 or a majority of the members of the Senate, but only a majority of the quorum of the members." Vice President Leni Robredo, on the other hand, reminded Mr. Duterte that "our membership in the ICC was not a sole discretion of the President---membership was the decision of an entire body." VP Robredo was being pragmatic, though, as she stressed that Philippine membership in the ICC "also assures (various) peoples' protection from human rights violations in their countries, so that when the time comes that we can no longer defend ourselves (from human rights abuses) there will be other countries who share our beliefs, to protect us." A group called the "Philippine Coalition for the International Criminal Court," led by the former Chair of the Commission on Human Rights (CHR), Loretta Ann Rosales, is seeking to invalidate the country's withdrawal from the ICC. Six senators from the Opposition, led by Minority Leader Franklin Drilon, also weighed in on the controversy, stressing the role of the Senate in enforcing a treaty---or abrogating it. Predictably, the President's men rallied to his defense. Executive Secretary Salvador Medialdia stressed that "Any time Mr. Duterte, as Chief Architect of Philippine policy, could withdraw from the ICC without consulting the Senate." Presidential Legal Counsel Salvador Panelo, on the other hand, made a more interesting---and thereby pertinent---assertion. He was quoted as saying that "Duterte cannot be put under the jurisdiction of the ICC for allegedly extra-judicial killings related to the administration's drug war, AS THE PHILIPPINES ALREADY WITHDREW FROM THE ROME STATUTE." Moreover, Panel asserted that since the Rome Statute "did not ripen into a law because it was not published in the Official Gazette or a newspaper of general publication, thus it never had the effect of a measure." Presidential Legal Adviser Sal Panelo's startling assertion that the Philippines already withdrew from the Rome Statute ought to be examined, IF THERE ARE SENATORS WIDE AWAKE AT THIS MOMENT. At the very least they should summon the debonair Panelo about this declaration---which, if true, debases the CONSTITUTIONAL PREROGATIVE of the Senate to approve or withdraw support for the Rome Statute, or for any international treaty, for that matter. Clearly foreseeable, however, is that Mr. Duterte's reputation abroad as one who resorts to summary justice would widen even more. Let's hope and pray that he does not act from pure whim, but as a statesman worthy of international respect. INQUIRER SAYS RETIRE NAIA. I SAY CONVERT IT TO PURELY DOMESTIC AIRPORT AND BEEF UP CLARK AIRPORT AS INT'L GATEWAY IN LUZON, EVEN AS RAMON ANG & HENRY SY/WILSON TIENG GROUPS ARE COOKING UP PROPOSALS FOR INT'L AIRPORT IN BULACAN & SANGLEY IN CAVITE, RESPECTIVELY. AYALA/ABOITIZ GROUP WANTS TO CONSTRUCT A SECOND RUNWAY AT NAIA. Young ladies whiling away time at NAIA 2 Terminal while awaiting flight resumptions. Last Friday’s accident at the Ninoy Aquino International Airport (NAIA)---ironically just five days ahead of the 35th commemoration of Ninoy Aquino’s heroism and martyrdom at the NAIA premises Aug. 21---was WAITING TO HAPPEN. Most everyone whose plane has ever taken off or arrived at NAIA has been keenly aware of how precarious the situation of our premier airport is, especially for the big birds. Last Friday the inevitable happened: a Xiamen Air Jet skidded off on NAIA’s one and only international runway due to heavy rains, and got stuck in the mud. 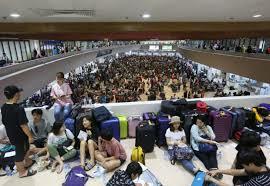 The resultant chaos in international flights to and from Manila we continue to feel till now. To cope with the closure of that solitary NAIA runway, 70 international flights also had to be cancelled to prevent massive pile-up at NAIA while dozens upon dozens of international flights had to be diverted to Mactan in Cebu and to Clark Airport in Central Luzon, as well as to Hongkong, Ho Chi Minh, KL and Bangkok. The impact in economic losses for both international airlines as well as the PH economy would be felt for weeks to come--- but most important of all, we Pinoys have come to realize with finality how vulnerable NAIA truly is. The bad thing is that the whole world now knows our weakness. Sadly, however, the only positive musing we could muster was how lucky it was that it was a smaller plane like Xiamen Air that slid off the runway, as it could be lifted by two cranes the day after the accident. What if it were one of those really big long birds! For decades various administrations have planned the modernization of NAIA and an absolute imperative was to construct another runway for those gigantic planes, but this never came about. NAIA has only one runway for international flights and a shorter one for domestic flights. It has been outmoded for a long while, and Metro Manila---a teeming jungle of humanity---has had only one airport---the one honoring Ninoy Aquino (what a disservice to him!). Contrast Manila's predicament with Tokyo, which has three airports: the Haneda Airport which is much like NAIA in proximity---25 km. from city center. Then there is Yokota, 40 km. from city center, used by the US Air Force, but which could be an emergency airport for the civilian population. Then there's Narita, the most used, 70 km. away. The thing to do now is to come to a forthright decision about NAIA. Today’s Inquirer editorial asserts that it’s "Time to retire NAIA.” As stressed, the airport that was meant to serve at most 31 million passengers a year is now strained to service 42 million passengers---and projected to rise to 47 million by 2020. My suggestion---and I’m sure officials of the Duterte administration have thought about this---is to convert NAIA to a COMPLETELY DOMESTIC AIRPORT handling increasing local flights as various resorts in the country take off with our tourism program. Corollary to this, CONCENTRATE ON TURNING CLARK INTO THE PRINCIPAL INTERNATIONAL GATEWAY OF AND TO THE PHILIPPINES. I have flown out of Clark a number of times for Europe and I notice that it still has remained like a poor cousin to NAIA, with limited flights to and from PH as well as limited facilities for passengers. Now that the disaster waiting to happen in NAIA has happened, I’d suggest that Clark be converted fast into the country’s premier international airport, and equipped with all the comforts and facilities as such. Clark’s advantages are several: principally, it has an excellent runway built by the Americans and great for the big birds. If another runway is necessary, land is available all around---unlike in NAIA in Paranaque where land is so tight, or if available, only at astronomical prices as the authorities would have to purchase subdivisions completely populated, if a second international runway were to be built. For us Filipinos, many of whom exhibit an insular mentality so that additional travel time to Clark is anathema, make the travel to this former US base easy and comfortable. If need be, let's construct a separate highway to address traffic to and from Clark to Metro Manila, as such highway would be far cheaper as it would only involve mainly rice lands. And ultimately, construct a railway to and from Clark to Manila for passengers and goods---far cheaper than expropriating plush subdivisions around NAIA in Parañaque for a second international runway. On the other hand, Cebu International Airport also has to be refurbished and upgraded to fully function as an international gateway---to absorb ALL the traffic to and from the progressive island provinces in the Visayas. End goal is to divert air traffic from Manila. In terms of population and potential for growth, PH cannot be considered small or even medium-size. Let us think big, but let's also put solid planning into our dreams and ambitions. I have traveled quite a bit in my professional work and I have been to some of the best airports in the world. Among the latest is the Malpensa Airport outside Milan in Italy, which took my breath away with its size, efficiency and amenities---so impressive. We can’t afford to stand still, as our neighboring countries are modernizing their airports. In Hongkong, reclamation is going on for a THIRD RUNWAY, with two terminals to be built. Kuala Lumpur’s airport is reachable in an hour by car, or ½ hour by high-speed train to city center. Singapore’s Changi Airport is developing A THIRD RUNWAY, along with Terminal 5. 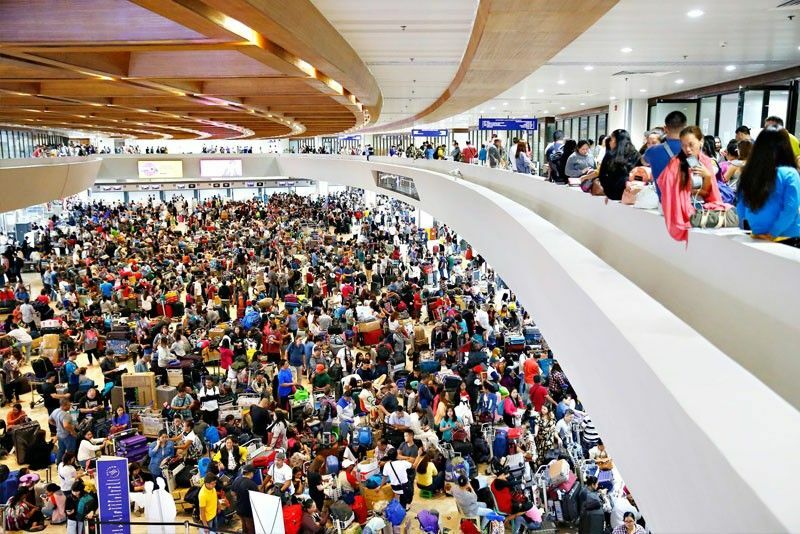 NAIA’S disaster waiting to happen indeed happened last Friday, but let’s already stop wringing our hands and tossing blame around---instead, let’s buckle down to work. The San Miguel Conglomerate, the largest in the country and led by dynamic visionary tycoon Ramon Ang, is said to be mulling a $15-billion international "aerotropolis" in Bulacan, Bulacan, with FOUR RUNWAYS and a proposed spillway into Manila of floodings in the area. On the other hand, a group led by the Henry Sy/Wilson Tieng consortium, in partnership with the Cavite local government, is said to be considering expanding the Danilo Atienza Air Base of the Philippine Air Force in Sangley Point, with some reclamation, at a cost of P763B. There's also the P350-B plan of the Ayala/Aboitiz and leading taipans to build a second NAIA runway and expand and link the three airport terminals. These plans are great and now is the time to DREAM BIG AND EXECUTE THOSE PLANS during the administration of President Duterte who likes to project himself as a dynamic leader. He’s still equipped with plenty of political capital---this is the time to show it off with sound decisions that will benefit the entire country. President Duterte graces PDP-Laban celebration where Nene Pimentel serenades him with popular postwar ditty, "You are my Sunshine, my only Sunshine." Bigger focus, however, on Sara's "Hugpong ng Pagbabago" especially given Duterte's recent revelation about his desire to "step down" and Star's banner today about his intention to join Sara's HNP. Query: is HNP preparing Sara for "succession to the throne?" Last Wednesday evening, Aug15, PDP-Laban, the party founded by former Senate President Aquilino “Nene” Pimentel Sr and son, former Senate President Aquilino “Koko” Pimentel III, held a reunion at the GSIS compound next to the Senate, to launch its "PDP-Care" program for typhoon victims. Gracing the occasion was no less than President Rodrigo Duterte who ran and won under its banner in 2016. It seemed like a convivial gathering of political forces, so that 85-year old Nene Pimentel---all white hair now and voice raspier than ever---even took to singing the American ditty popularized during early post-war years, “You Are My Sunshine, My only Sunshine,” and dedicated it to Mr. Duterte, "who has always been my sunshine.” The President, staying late into the evening, graciously acknowledged Nene's tribute. 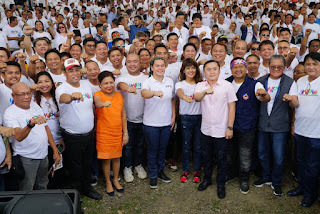 Behind the festive atmosphere of the PDP-Laban celebration, however, loomed the shadow of the new “regional party” announced days ago by presidential daughter and Davao Mayor Sara Duterte, the “Hugpong ng Pagbabago” (HNP), in a launch in Paranaque City.. Like an ultra-powerful magnet, the HNP instantly attracted various political groupings---though most of them were hardly the “regional” type. 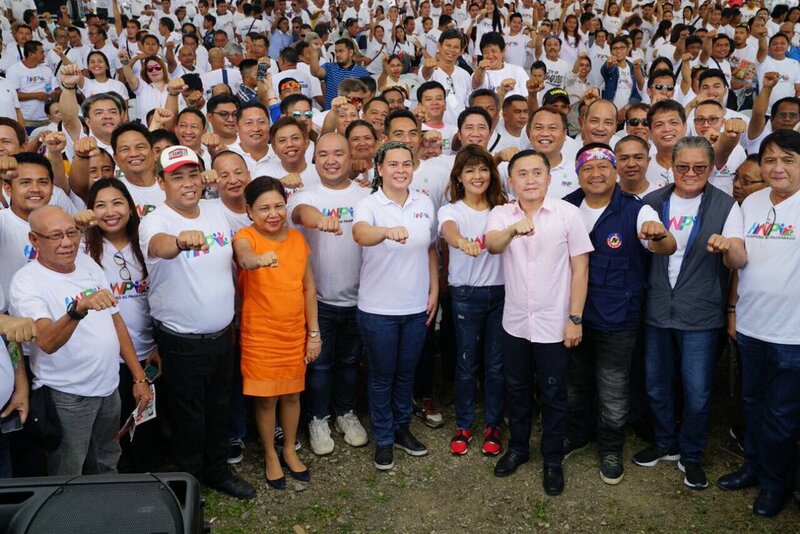 To be sure, there was initially a sprinkling of regional politicians from Mindanao and the Visayas at Sara’s launch---a total of 11 governors. More significant, however, were those from the national political parties who flocked to the HNP launch, flaunting the Duterte signature fist-bump. Adding to the political excitement over this new "regional" party is the fact that today, Friday, Aug. 17, the Philippine Star headlined that Duterte will join Sara's HNP. This news headline should not be treated with incredulity, however, as blood is thicker than water, most especially in politics. Boosting the HNP were national figures like Sen. Cynthia Villar and Rep. Pia Cayetano of the Nationalista Party, whose son and sibling, respectively, are key members of the President’s Cabinet---namely Secretary Mark Villar of Public Works and Secretary Alan Peter Cayetano of Foreign Affairs. Also very prominent at the HNP launch were Gov. 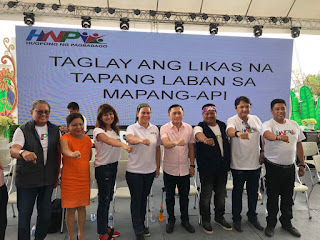 Imee Marcos of the “Ilocano Timpuyong” NP Ilocos chapter; Rep. Fredesnil Castro of the National Unity Party; Quezon City Vice Mayor Joy Belmonte of Serbisyo ng Bayan Party; former Batangas Rep. Mark Leandro Mendoza, secretary-general of the Nationalist People’s Coalition; and Gov. Lilia Pineda of the Kambilan Pampanga, who's very close to Speaker Gloria Macapagal Arroyo. Another recruit was Presidential Spokesperson Harry Roque. Statistics-wise, attendance at Sara Duterte’s HNP launch may still be too insignificant to be touted as a “regional party:” 2 out of 23 senators; 1 House member out of 292 members; 11 of 81 governors. But noteworthy was Sara's release of HNP's initial list of senatorial candidates to back up for the 2019 mid-term elections: former PNP Chief Bato de la Rosa, presidential aide Bong Go (despite his frequent denials, he went around distributing relief goods during the storm) and Sen. J.V. Ejercito. Certain to also be included is Harry Roque. 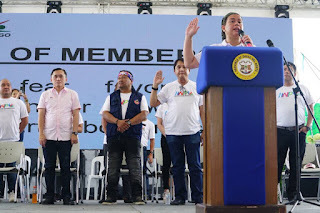 With the entry into the national political ring of the new “regional” party from the South, however, all eyes would be on the fate of PDP-Laban, the party under which Mayor Rodrigo Duterte ran for the presidency in 2016 and won. PDP-Laban leaders have admitted that some of their politicos are flocking to HNP, and this has led to “confusion” among party leaders as PDP struggles for unity and survival ahead of the 2019 mid-term elections. At the outset, Mr. Duterte was quoted saying he has nothing to do with the HNP of his daughter, but he is also set to grace the swearing-in and oath-taking of its political leaders. As if to make amends, however, he also attended the anniversary celebration of PDP-Laban last Wednesday. Then came the expected, delivered by the Philippine Star headline today: Duterte is joining HNP. The question now is, what happens to PDP-Laban with its "super-majority," if Duterte himself is abandoning the party he won under? The situation is becoming tough for PDP-Laban. Senator Koko Pimentel, a stout ally of the President, was yanked out of the presidency of the Senate and the party's majority leader, Sen. Tito Sotto. was installed in that post. Koko admitted in media that “the possibility of HNP endorsing national candidates could be an issue to the ruling party.” Clearly an understatement. 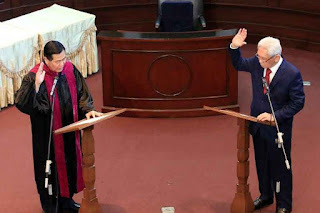 Governor Anthony del Rosario of Davao del Norte, one of the HNP stalwarts, admitted that his group did not anticipate “the level of interest that other political parties had with (Sara Duterte) Carpio’s party.” Del Rosario also stressed anew that the HNP supports President Duterte’s political agenda and will endorse 8 senators all supportive of him. Sara Duterte as defender of the political fate of her father, especially if it should worsen, or as eventual successor to the throne through an electoral coup in 2022? Any which way, Duterte's popular daughter is---as the French would say---"tres formidable." In aftermath of firing of Deputy Ombudsman Carandang, new Ombudsman Martires will be measured by same yardstick of arrogant independence that Conchita Morales displayed. Titimbangin si Martires nguni't kulang kaya? The sacking of Overall Deputy Ombudsman Melchor Arthur Carandang by President Duterte, as conveyed in a 10-page decision by Executive Secretary Salvador Medialdea last July 30 will be watched for weeks, months and even years to come---for a good number of reasons. The Palace had objected to the disclosure by Carandang of bank records of the Duterte family, which it felt Senator Antonio Trillanes could use to accuse the President of plunder. Carandang had claimed that the figures were obtained from the Anti-Money Laundering Council. Actually, sympathizers of the President are predictably rallying to his defense inasmuch as the release of the figures would be regarded as questionable from their perspective. As Presidential Legal Adviser Sal Panelo put it, "What is patently illegal is that Carandang created a prejudiced environment against a person he is investigating".There is some truth to this, no doubt. For the moment, however, the legality or non-legality of Deputy Ombudsman Carandang's disclosure of the supposed wealth of the presidential family becomes less interesting---compared to the way he was dealt with by the Administration and implications for the Office of the Ombudsman in the long run. A major point at issue here is the harshness of the manner whereby Carandang was fired. According to Secretary Medialdea the dismissal order spells "accessory penalties" of cancellation of eligibility, forfeiture of retirement benefits, being barred from taking civil service examinations and perpetual disqualification from holding public office." For a civil servant with lifelong service to the government, the forfeiture of retirement benefits is doubtless the harshest, as it deprives him of the nest egg he hopes to enjoy in the twilight of his life. What's interesting was that the Palace clearly waited until Ombudsman Conchita Carpio Morales was safely retired two weeks ago, before firing Carandang. 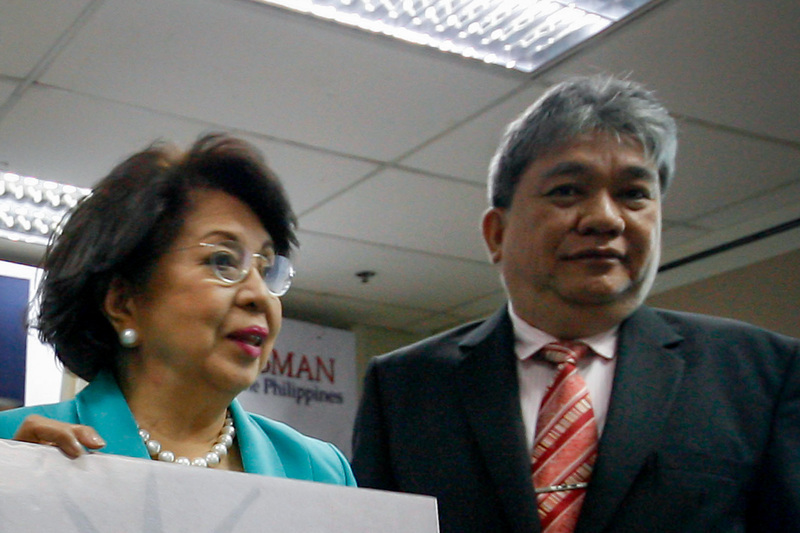 Actually ex-Ombudsman Morales already clashed with the Palace over her Deputy's dismissal by the Palace as early as last Feb. 1, but the fiercely independent and seemingly arrogant Morales simply refused to carry it out. Morales argued with her signature arched-eyebrows that the President had no business firing Carandang, inasmuch as the Supreme Court had ruled as early as Jan. 28, 2014 that the provision of the "Ombudsman Act" of 1989 that gives the Office of the President disciplining powers over the government's watchdog deputies is UNCONSTITUTIONAL. As per that Act, only the Ombudsman can discipline his or her deputy, and she probably would have done so, except that the Palace couldn't wait for her retirement to cool off a bit in axing Deputy Carandang. .
As Morales insisted to media, "The Ombudsman will not allow herself to betray her sworn duty to uphold the Constitution by recognizing what is patently unconstitutional, as ordained by the Supreme Court." There were initial threats about impeaching Morales on this issue, but this was abandoned inasmuch as the feisty lady graft-buster remained popular and admired for her guts vis-a-vis Duterte. While Morales was in the saddle, the Duterte administration kept its distance. The Palace appointed 69-year old former Supreme Court Justice Samuel Martires last Monday as Morales' successor and all eyes are now on the poor man, who will be measured by standards set by the feisty lady. Would Martires enforce the President's order to kick out Carandang or would he have the guts to follow his gutsy predecessor on her avowal of independence for the office? Recall that the Palace had already clashed with Ombudsman Morales when it ordered the 90-day suspension of her Deputy Ombudsman---on the issue of his supposedly irregular release of bank records of the Duterte family, allegedly in the billions, to the President's arch-critic, Sen.Antonio Trillanes. The Palace feared that the information supposedly from AMLC would be used by Trillanes to charge Mr. Duterte with plunder. deputy official. The Administration's rationale seemed to be that the authority TO HIRE also implies the authority TO FIRE, but this is not upheld by recent decisions of the Supreme Court. Some observers rue, however, that SC decisions are not cast in stone, and Presidential Spokesperson Harry Roque has already predicted confidently this reversal by the SC.. New Ombudsman Martires, however, seems to take the safe way out when he stressed that the sacking of Deputy Ombudsman Carandang "is a matter left to the courts to decide." . President Duterte will retire on June 30, 2022, and until then, it is easy to predict that many legal skirmishes will still be fought by his officials in his name. With the retirement of the feisty Conchita Carpio Morales, aunt of the President's son-in-law, lawyer Maneses Carpio, last July 26, the ball is now in the court of new Ombudsman Martires whose association with Mr. Duterte appears to have come a long way. Some observers don't give Mr. Martires the same allowance for impartiality that Carpio Morales displayed. For one, Martires, a fraternity brod of President Duterte, who took his oath as Associate Justice on March 8, 2017---who also happened to be Mr. Duterte's very first appointee to the SC. Justice Martires had previously occupied the post of Sandiganbayan for 10 years, starting in 2005, leaving a trail of controversial decisions. In 2012, he rendered the verdict clearing Marcos and Bobby Ongpin in the alleged Binondo Central Bank scam. News accounts also said that in April 2013, Martires penned the Sandiganbayan resolution upholding the plea bargaining agreement struck between military comptroller Carlos Garcia and the Ombudsman. The Filipino people are in for interesting times.